Many thanks for all the concerned messages. We’re fine thanks, as on this occasion the hailstorms passed us by. To the north of us, primarily in Bourg and Blaye, and the southern Haut-Médoc, they were not so lucky, and we send our best wishes to our fellow viticulteurs whose vineyards have been damaged. The hailstorm struck on Saturday morning, 26 May, and we had an early warning from friends in the city of Bordeaux with texts and tweets, mostly accompanied by images and videos of hailstones and flooded streets. 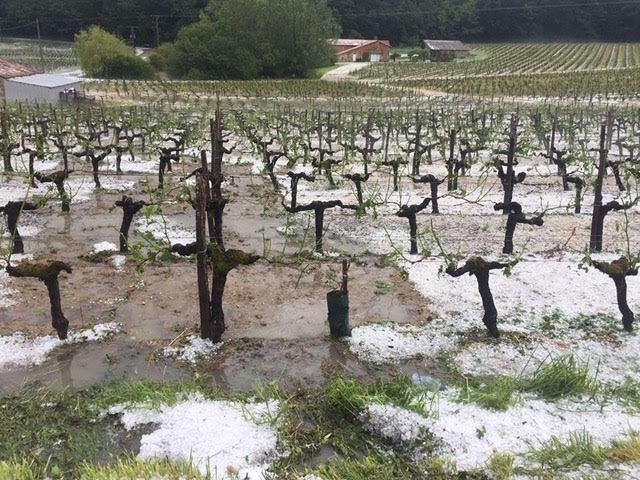 The hailstorm then moved up towards the Gironde estuary, damaging vines on the left bank around Macau and at the southern end of the Haut-Médoc, before causing huge damage to vineyards on the other side of the river in the picturesque, hilly areas of Bourg and Blaye. (Closer to home, the picture above of her neighbour’s vines is from Dawn Jones-Cooper of Château de Monfaucon near Genissac on the Dordogne river, less than 10 miles from us.) The storm then shifted north to Cognac. I can’t remember such a forceful deluge of hail hitting the city of Bordeaux before, at least not this century, so the immediate flurry of videos on social media probably spurred the swift news coverage from traditional outlets. And, as ever, most headlines about hail carry all the usual hyperbole – ‘destroy’ (Mail), ‘devastate’ (Telegraph), ‘ravage’ (Reuters) and, my favourite from The Times, ‘bankcruptcy’. 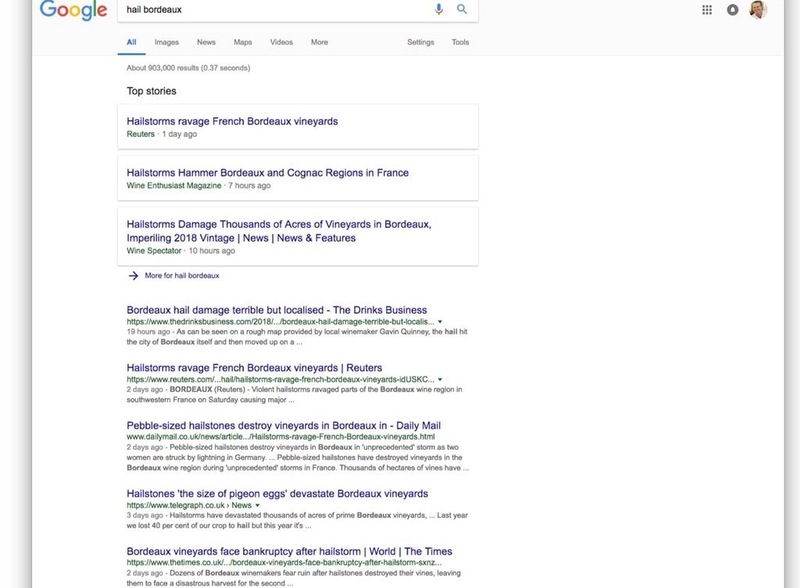 I’m afraid my chat with the journalist Rupert Millar resulted in the least exciting headline of the lot, in The Drinks Business: ‘Bordeaux hail damage terrible but localised’. Dull, yet that’s pretty much the truth of it. Unlike the frost in April 2017, which was widespread across the whole region, hailstorms travel in what the locals call a ‘couloir’, or corridor. The damage is therefore localised, with terrible impact on some vineyards, while neighbouring vines can be untouched. It’s a case of the unlucky few – and phew for everyone else. So let’s put the numbers in context. 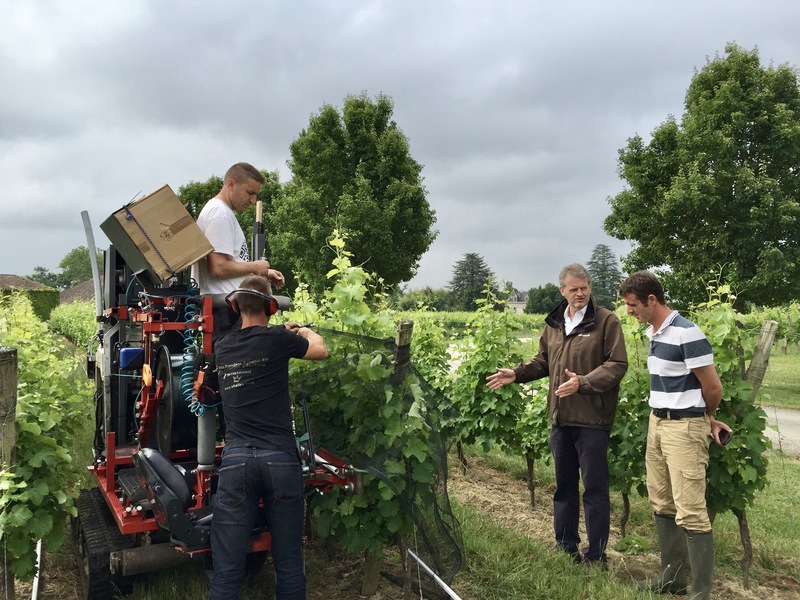 There are around 9,000 hectares of vines in Bourg and Blaye, and about 60% were affected (5,500ha) with a third very badly so – 3000ha suffered over 80% loss. (To be frank, an 80% loss is likely to mean no crop at all.) That is, indeed, catastrophic. Three of the photos above, of Bourg, Blaye and the Haut-Médoc, are from this article in the SudOuest while the fourth, of undamaged vines, was taken by me on the same day, 26 May, in 2017, as a contrast. Credit photos, clockwise from top left: C.B., Georges Gobet AFP, S.F., Gavin Quinney. In the Haut-Médoc, 1,200 hectares were touched, with 400ha at over 80% loss. There are about 16,000 hectares in the Haut-Médoc and Médoc, so, fortunately, the losses were relatively small, however bad it might be for the unlucky growers. The Entre Deux Mers saw 400ha damaged, from an enormous total area of something over 35,000 hectares (mostly red Bordeaux). 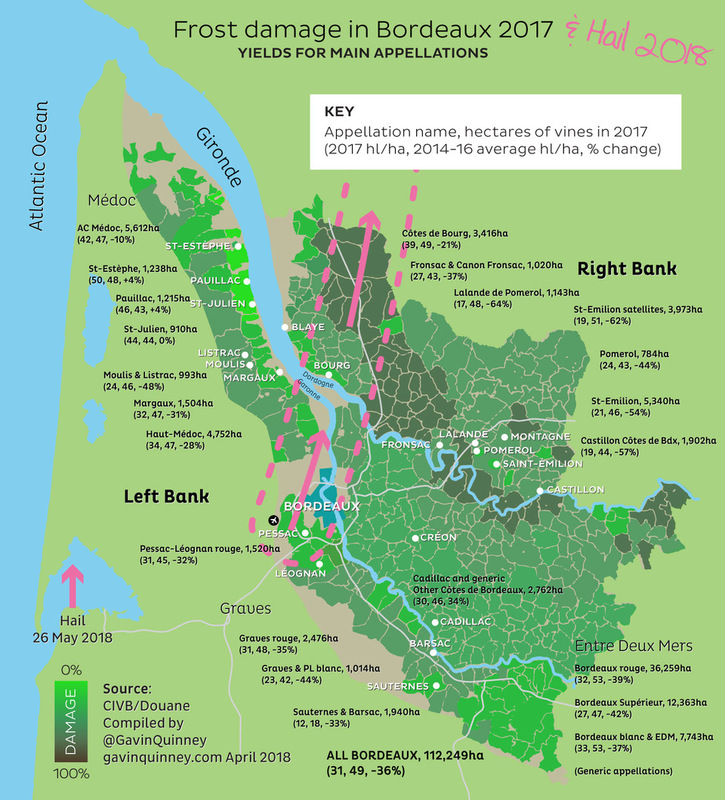 In the bigger picture, there are 112,250 hectares of Bordeaux vineyards, so the 7,100ha of vines affected adds up to 6% of the total, with just 3% losing most of the crop (3,400ha). Contrast that 3% with the 33% fall in production of Bordeaux 2017 from the 10 year average, and 40% down on 2016 – due to the late Spring frost. Frost might be less dramatic – it’s hard to take a video of it at 5am – but it can have a far greater impact. For the growers looking after the 94% of vineyards that haven’t been affected by the hail, there’s more concern now about the weather for the flowering which has started recently. If the rain continues, the potential yield could be seriously impacted, not least because Merlot, by far the most widely planted variety, is vulnerable to poor fruit set, and this can easily happen when it’s wet during floraison. On the bright side, few people remember the hailstorms of May 2009. Thousands of hectares were affected in the Entre Deux Mers, the Graves, St-Emilion and Margaux among others – and we ourselves lost well over half the crop – but 2009 went on to become one of Bordeaux’s greatest vintages. For many, that is. People always ask if you can ensure against hail. Yes, you can, though it’s like a bet, and the odds are getting shorter if the premiums are anything to go by. Also, can we not protect the vines? Again, yes, you can use anti-hail nets, but these are not permitted by the INAO and the bodies that control the Appellation system (and Bordeaux is 99% AOC or AOP). After losing much of the crop to hail in August 2013, we installed trial anti-hail nets in 2015, and they seem to work fine, though we haven’t had hail to see the actual level of protection. The trial is really to see how manageable they are, and to check how long they last. With the cost spread over the 10 year lifespan, allegedly, they’d be cost effective, but much less and it would be questionable. This, of course, depends on how much you sell the wine for, so I can’t see why more prestigious appellations don’t push for them (low, high density vines, such as in Pauillac, excluded). Finally, are we seeing more extreme weather? It’s hard to say with frost, as 2017 was the first really bad occurrence since 1991. As for hail, we’re certainly receiving more storm warnings, with four or five hail alerts in May 2018 alone. Is that the Meteo office covering itself, just in case, or simply that the warnings are more easily distributed – notably on my iPhone? The actual occurrence of serious hailstorms are not more frequent, however. 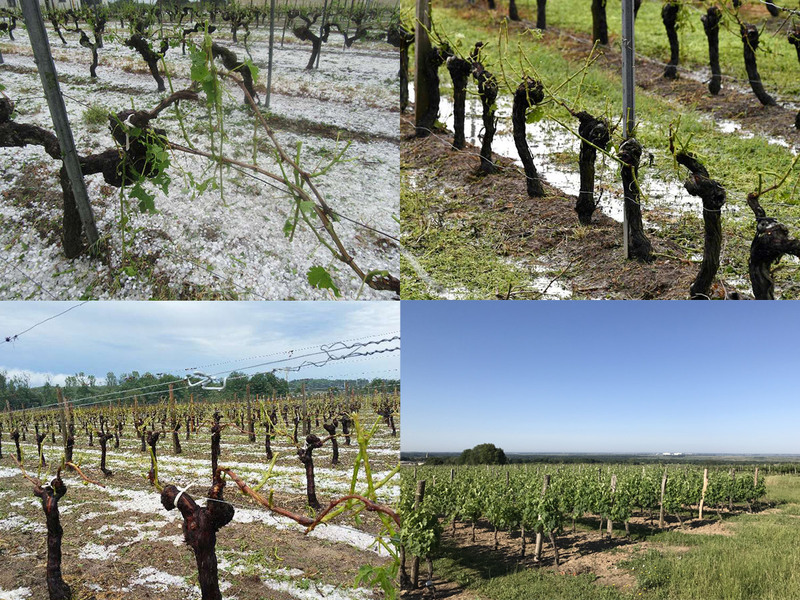 This century, Bordeaux has seen serious impact to vineyards from hailstorms in June 2003, July 2007, May 2009, September 2011 and August 2013. And now May 2018. Let’s hope that’s the end of it – for this year at least.